If you’re new to the gluten free diet it can be overwhelming at first. All the things you used to love like pizza, pasta and bread are now out- don’t panic! You need to focus on all the great foods you can have and learn to stock your gluten free kitchen. As with anything associate with living a gluten free life, preparation is key! There is nothing worse than having an empty kitchen, being tired, feeling defeated on the gluten free diet and tempted to get in the car and pick up some gluten-filled take out! Don’t do it! Before we get started on what you should always keep in your kitchen, be sure you’re aware of what you can eat on a gluten free diet! 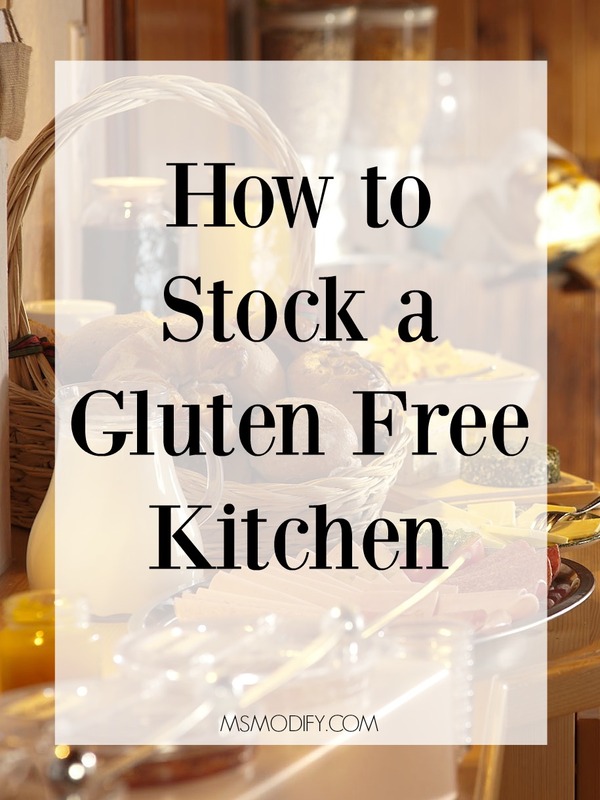 If your kitchen is always stocked with some gluten free basics you won’t have to worry about being caught in that scenario. I’ve put together some basic staples you should keep in your kitchen that are gluten free, everything from when you’re in the mood to cook, to when you’re in the mood to throw a pizza in the oven! Fruits and Veggies: Fresh fruits and vegetables are naturally gluten free in their pure form, so feel free to stock up on all your favorites! Be cautious when purchasing pre-cut fruits & veggies because you don’t know if cross-contamination occurred on the cutting surface or even with the knife used. Poultry/Meat: Poultry and meat is naturally gluten free, so as long as you’re buying these items in their pure form you are good. Avoid purchasing pre-marinated meat because you can’t be sure it’s gluten free, it’s best to just marinated it yourself. If you’re buying bacon, sausage, veggie burgers, etc make sure the package says gluten free. Fish/Seafood: Fish and seafood is gluten free in its pure form, so once again don’t buy anything marinated or stuffed. Also, be aware that most imitation seafood contains gluten in it. Dairy Products: Milk, most yogurt, cream cheese and pure cheese (I would avoid blue cheese since it can contain gluten) is gluten free. I always make sure I have yogurt in my fridge since it’s a good source of protein and probiotics. My favorite brand is Siggi’s. Rice: Rice comes in many varieties and in its pure form is gluten free, just avoid pre-packaged seasoned rice. Quinoa: Quinoa is my go-to grain! Even though it’s naturally gluten free, I always make sure to buy “certified gf” so I don’t have to worry about cross-contamination in the fields or during processing. I love to make quinoa like a cold tabbouleh-type salad or use it hot in place of rice. Beans/Legumes: Beans and legumes are cheap and offer lots of protein. If you buy them canned, just make sure you don’t get seasoned ones just incase they contain gluten. You can always season and spice them yourself. Nuts/Seeds: Proceed with caution when buying pre-made trail mixes unless it states gluten free, however nuts and seeds in their pure form are gluten free. The issue with nuts and seeds are that many times they are processed/packaged in a facility with wheat, so make sure you read labels! Gluten Free Pasta: You may have to try a few until you find gluten free pasta that you like. I like Ancient Harvest Quinoa Pasta. It doesn’t break apart like many gluten free pastas do and I like knowing it’s more nutritious than corn or rice pasta. You should always have gluten free pasta in your pantry for busy days that you need a quick meal. All-Purpose Gluten Free Flour: If you’re new to the gluten free diet, stock up on your all-purpose gluten free flour because I can guarantee you will be baking! Many pre-made gluten free baked goods don’t make the cut as far as texture and flavor, so baking is a must. I prefer using all-purpose gluten free flour where you don’t have to worry about mixing multiple ones together. My favorite is Cup4Cup where you can literally take any recipe and substitute it for the regular flour. Protein Bars/Snacks: I always recommend snacking on whole food items (fruits, veggies, nuts, etc) since they are healthier, but come on that’s not realistic always. When buying gluten free snack foods make sure you read the label and avoid products packaged/manufactured in a facility with wheat. Gluten Free Cereal: Cereal is another great staple you should have in your gluten free kitchen. I recommend on sticking to ones that are certified gluten free, as some of the large brands like Cheerios are not safe and I don’t recommend if you have celiac. Gluten Free Bread/Tortillas: Most gluten free bread is stored in the freezer, so make sure to do the same at home. Bread is something you will most likely have to experiment with at first until you find one you like. Be prepared to try some bad ones! My personal favorites are made from Schar and Canyon Bakehouse. I don’t eat nearly as much bread now that I’m gluten free, but it’s always nice to have it in the freezer for days I’m in a pinch and need to make a sandwich. I also always keep tortillas around too because I like to mix it up and make wraps. Make sure you read the label and stick to corn tortillas that say gluten free because one time I accidentally bought a blend of corn and flour! My favorite type is the Mission Soft Taco Gluten Free tortillas…with these you will never miss flour tortillas! Gluten Free Frozen Items: I don’t recommend living on frozen meals, however they are great to have when you’re in a hurry or tired after a long day. I recommend Amy’s Kitchen frozen meals. Just be careful because not all their products are gluten free, so read the label before purchasing. Frozen gluten free pizza is something else I always have in my freezer. This is something else you will have to experiment with until you find one you like. My personal favorite is Freschetta Gluten Free Thin and Crispy Pizza. Sauces: Gluten tends to lurk in many sauces, so make sure you read labels. For example, soy sauce contains gluten so make sure you only buy gluten free soy sauce. Just because you’re gluten free doesn’t mean you have to miss out on flavor. Don’t be afraid to play around with marinating and using different sauces. You can read a list of gluten free condiments here. Canned Goods: Canned goods are something else to have when you’re in a crunch. As I previously mentioned, avoid pre-seasoned items and look for items labeled gluten free. You can read a complete list of gluten free soups here. Spices: Since you are no longer going to buy pre-marinated, pre-seasoned items you will need to have your spice rack stocked. You can read find out which brands are gluten free here. What’s something you always have in your kitchen? This entry was posted in Lifestyle, Products and tagged gluten free kitchen, gluten free products. This is such a great post! 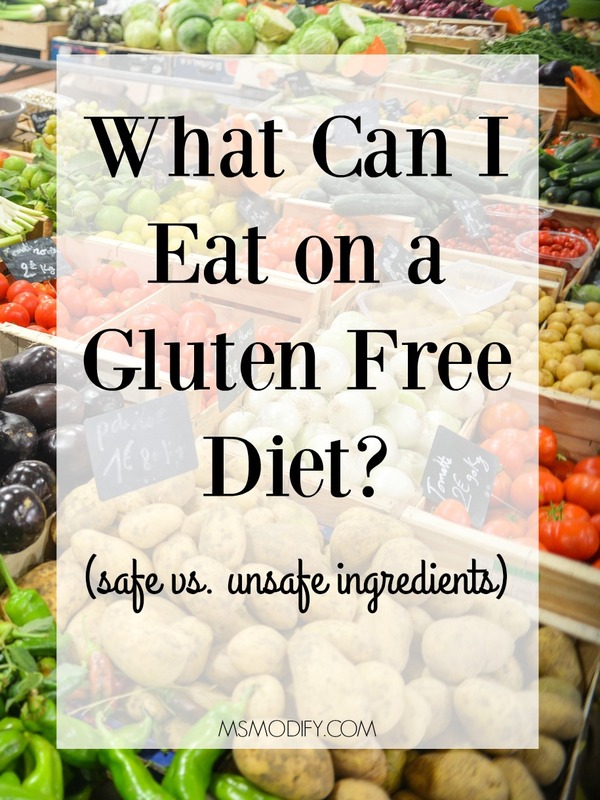 I wish I had this list when I first went gluten free as I was totally flying blind! Thanks! I know, so do I! Good article, I agree with your choices of flour, pasta and bread. Also one should read the label for fat, salt and sugar content, it seems some gluten free bread and nutrition bars are very high in these, probably to make them tasty, soft and not dry. So if you are watching your cholesterol be very careful what you choose and read how much fat content is in the product. Yes you’re right! Just because it’s gluten free doesn’t make it healthy! Thank you for this information. Just and finally diagnosed with Crohn’s and Celica. It’s been really really hard to eat. If you have Crohn’s, you may need to be dairy free as well as gluten-free. 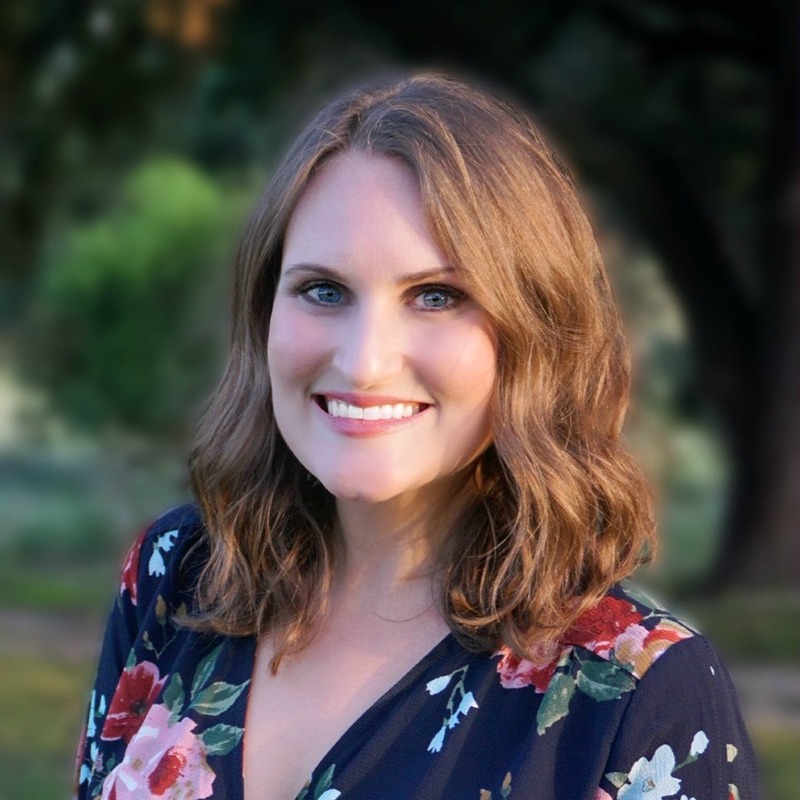 I was diagnosed with Crohn’s in July, 2018, and life got much better when I opted out of dairy. Goat’s milk is delicious! Just found this information through Pinterest and already loving it. My girlfriend has been having some stomach issues so we are trying to cut gluten from her diet (few days in and she hasn’t had any of her normal issues) and this will be amazingly helpful while we figure things out. I’m glad you’re finding it helpful! Has she been tested for celiac disease? If not, it’s really important she gets tested before eliminating gluten because follow-up treatment is crucial! Email me if she has questions! No it’s being done more from the gluten intolerance view then celiac. I still recommend getting tested, so that she can eliminate a diagnosis and then proceed with a gf diet for gluten intolerance! This was a great post. My little one (six years old) was just dx with Celiac. We live in an extremely low income and I am scared to death about trying to make ends meet on a GF diet. But seeing this post made me realize that many of the foods listed aren’t going to cost me any more than I would usually pay. Thanks! Big lots is the best place around for gluten free products like almond flour and such. Good luck-6 years old and having to learn to be vigilant will take consistency at home. God bless! Thanks for the informative post! In regards to freezer meals, I have found gluten free Lean Cuisine freezer meals at my local Target. Here is a link to the current varieties that they make, https://www.leancuisine.com/products/search?searchTerm=&specialty=Group_133&cuisine=&entree=&productline=&orderBy=Rating. I love that they seem to have an ever growing selection and are reasonably priced. Thank you so much for sharing this info! I’m going to look for them! Best article! I have been diagnosed with Crohns and Celiac disease. You made it so simple on what to buy at the grocery store. I’ve been feeling very overwhelmed with this new diseases and diet. My 8 year old daughter just got tested for celiac and it came back negative so I am currently doing a food journal on her until her next appointment next month. I cut out gluten for a few days and she felt so much better. She however had turkey tonight for thanksgiving dinner and it gave her a stomachache and headache. Not sure if they put spices or something on or in it. It’s very hard for her cause she was already a picky eater because of all the foods that made her not feel good. Any ideas for a picky child eater? Was she eating gluten-free when she was tested? If so, it won’t be accurate. Gluten intolerance is also something it could be. She may be picky because things are making her feel sick. A food diary is a great idea to narrow things down and then you can go from there! We recently had the same issues with a granddaughter and swore it was celiac, since her mother and I (Maternal gma) are both celiacs. The tests were repeatedly negative, and we finally found out that she was allergic to dairy and eggs, which are so commonly found in items with gluten! Your post just stuck out at me that perhaps allergy testing might benefit your daughter! Good luck! Both situations are extremely hard to deal with, but knowing what to avoid will help! Thank you for this!! My 11yr old son was just diagnosed with wheat anomaly allergy, awaiting lab work for celiac. They think it’ll probably be positive since he already has an autoimmune response with eosinophillic esophagitis. They said the easiest diet for him regardles sis gluten free. My husband and I will do this with him, but I do havekne question….My mom has jumped down my throat already about how we (husband and I) won’t be healthy gluten free because we don’t have an allergy to it. Is it true that we shouldn’t do gluten free with him? I hate the thought of eating his favorite foods in front of him, when he has to have gluten free-knowjng we aren’t eating gluten free. Also not sure I can afford 2 sets of groceries, my husband is a teacher so it’s a once a month paycheck, and I’m going to school. Finances are tight, lol. Any insight? Thank you again for this article! I’m glad you found this helpful! I’m sorry to hear about your son, I’m sure it’s a challenging time for you all. Hopefully, once he’s on a strict GF diet he will feel much better. My husband doesn’t need to eat gluten free, but our entire kitchen is gf. We choose to have a gf kitchen so I don’t accidentally get sick through cross-contamination. He eats gluten if he’s out, but it’s funny because he says he notices he feels better when he eats gf at home! Just a heads up, gluten free tends to be more expensive, but I focus on getting whole foods (veggies, fruits, meat, nuts, etc) rather than gf packaged food. I know people have very different strong opinions, but I think having you and your husband eat gf at home is a healthy thing for you guys! Also, you can find good deals on gf packaged food at Walmart, Big Lots and even TJMaxx/Homegoods! I also have parchment paper or aluminum foil for my baking sheets and I’ve ditched my wooden spoons for silicone or metal. Currently I am not sharing a kitchen with anyone, but when I did, these things helped a lot. Oh yes! Parchment paper & foil are good staples to have! I’m new to gluten free….so thank you for your post. You’re welcome! Feel free to email me if you need additional support/tips!